A round space of 5 meters in diameter sets the scene for the installation Walk in Silence. As the spectator you enter the space surrounded by 11 speakers. All of them are different in format and each one produces a different sound. It is the sound of a singing woman with a soft voice. She sings in a very natural way, like some of us sing while taking a shower. The sound slowly reverberates through the space, from one speaker to the next. 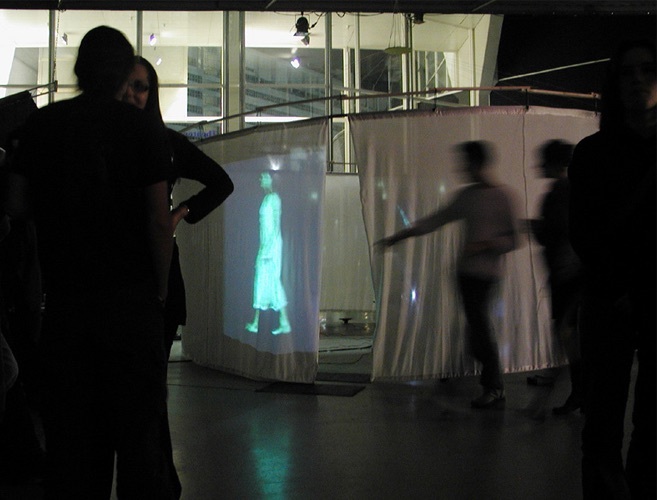 There is a projection of a woman dressed in white walking around in synch with the sound. Her lips do not move. When somebody enters the space, the woman will look at the spectators. For a moment she will look surprised, pleased, jolly or disturbed. Following that she will start walking and singing again just as if nothing had happened.